What is Mebucain Mint (Lidocaine HCL/Cetylpyridinium Chloride) used for? 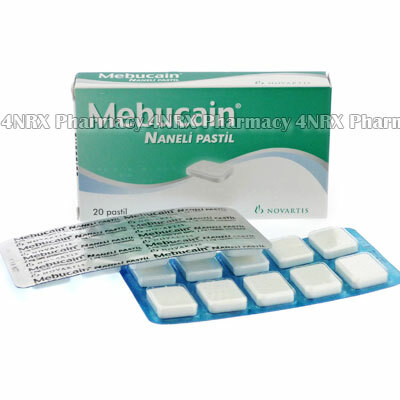 Mebucain Mint (Lidocaine HCL/Cetylpyridinium Chloride) is a medicated throat lozenge used to treat throat infections and their symptoms. The lozenges contain a combination of an antiseptic that fights bacteria along with a local anaesthetic that reduces throat pain and coughing that accompanies these conditions. This makes it useful for using while suffering from upper respiratory tract infections as well as cold or flu. Your doctor may prescribe this medication to be used along with others or for the treatment of other unlisted conditions, as well. How should I use Mebucain Mint (Lidocaine HCL/Cetylpyridinium Chloride)? Mebucain Mint (Lidocaine HCL/Cetylpyridinium Chloride) should be used according to your doctor`s instructions to get the best results from treatment. One lozenge is normally used one to four times each day as needed. Place the lozenge on the tongue and keep it in your mouth as it dissolves until it is completely gone to ensure even dosage. Do not crush or chew the lozenge as this may change or weaken its effects. Always ask your doctor any questions you have about the medicine to ensure the correct usage. What are the side effects of Mebucain Mint (Lidocaine HCL/Cetylpyridinium Chloride)? Mebucain Mint (Lidocaine HCL/Cetylpyridinium Chloride) will not cause side effects in most patients. Stop using the lozenges and immediately contact your doctor if any serious or worrying symptoms occur such as skin rashes, hives, swelling, or difficulty breathing. These conditions may require reduced administration frequency or immediate medical attention in serious or life threatening cases to prevent further health complications from occurring. Strictly use Mebucain Mint (Lidocaine HCL/Cetylpyridinium Chloride) as prescribed and follow all instructions provided by your doctor. Safe, suitable, and optimum dosage can vary and is dependent on the patient`s health and medical history, as well as the condition you are treating. Mebucain Mint (Lidocaine HCL/Cetylpyridinium Chloride) may not be safe or suitable for all patients. Always ensure your doctor is informed if you are pregnant or breastfeeding, using any other type of medication (including non-prescription medicine, vitamins, and supplements), as well as if you have any allergies, other illnesses, or pre-existing medication conditions.